Now six features into his career, director Wes Anderson has established himself as the most distinctive comedy auteur of his generation, with an instantly recognizable style that’s defined by crispy composed images, idiosyncratic pop soundtracks, and a tone that balances dry wit and deep melancholy. Though his debut feature, 1996’s Bottle Rocket, only drew a small coterie of followers—mostly on video, in the wake of his MTV Movie Award for Best New Filmmaker—Anderson raised his profile enormously with his 1998 follow-up Rushmore, which revived Bill Murray’s critical reputation and influenced a wave of indie films that followed. From there, Anderson and a rotating cast of players have continued to make new variations on his themes of family and outsidership, including 2001’s The Royal Tenenbaums, 2004’s The Life Aquatic With Steve Zissou, and 2007’s The Darjeeling Limited. Though adapted from a Roald Dahl book and shot using the painstaking stop-motion animation process, Anderson’s latest effort, Fantastic Mr. Fox, seems right at home with the rest of his filmography. George Clooney voices the rebellious eponymous character, the head of a Tenenbaum-like family of foxes trying to balance civility with their nature as wild animals. When three mean farmers—Boggis, Bunce, and Bean—try to flush the thieving Mr. Fox from his underground hideaway, he and his cohorts embark on a wild adventure to protect their way of life. Anderson recently spoke to The A.V. Club about meshing Dahl's voice with his own, directing the animation remotely, and what this film has in common with Where The Wild Things Are. The A.V. Club: This is the first time you’ve adapted source material rather than working from an original screenplay, yet it’s still unmistakably your film. How did you go about squaring your sensibility with Roald Dahl’s? AVC: You’re sort of doomed to be yourself. AVC: This is a fairly deep cut in Dahl’s bibliography. What drew you to this book? WA: Two things occurred simultaneously, which was to do this book and to make a film in stop-motion. And particularly make a film in stop-motion with fur and those kinds of texture. And this book was perfectly suited for that. It’s animals, and it’s also a book I’ve always loved. It’s Dahl, who I feel very close to—so much of his work has inspired me over the years, and it’s one of the big Dahl books that’s never been made into a movie or anything. So it was that combination of things, I guess. The other thing is that I loved this character, Mr. Fox, as a kid. I loved that he rescues everyone, but he’s also kind of the one who got them into the trouble in the first place. And the way he talks, his flair. And of course the other thing I always loved is the digging. AVC: You had to clear this project with Dahl’s widow. How did you go about doing that? What was that relationship like? WA: I don’t think I understood going into it how carefully the Dahl estate controls the books, and how many people are trying to get them and can’t. I met one of the representatives of the Dahl estate, and then they arranged this lunch with [Dahl’s wife Liccy], but I didn’t know that it was an audition, which I think it was. But as a result of my not knowing, I was more comfortable and relaxed than I might have been, and I didn’t feel like I was having to prove myself. I just thought we were going to have lunch and talk about how we would go about this. But as it happened, I did like her enormously, immediately. We had a great time when we first met, we had lunch in New York, and then she invited me to come to Gipsy House, to their house in England the next time I was going to be there. I went there, and I saw where the book is set. He wrote it in that house, and the locations in the book are sort of right there in front of you. 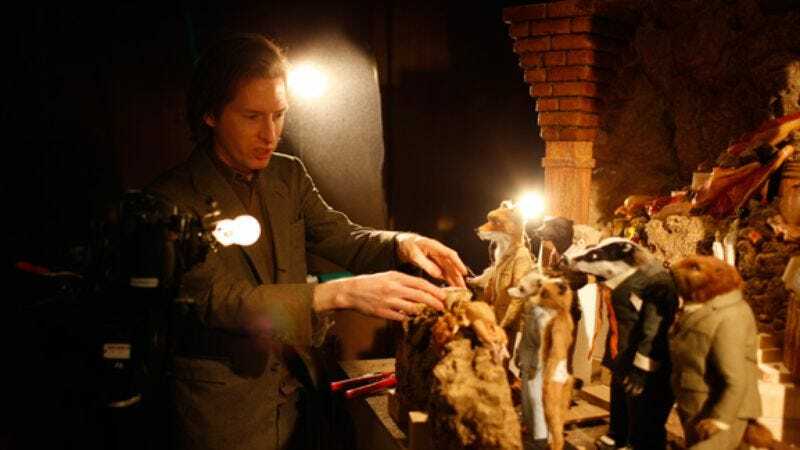 And I kind of thought, “We should make this movie in England, and we should model it on this place.” And as we went along, we also modeled Mr. Fox more and more on Dahl, and it sort of became a combination of an adaptation of Fantastic Mr. Fox and an homage to Roald Dahl in general. AVC: The film took about two years to make. What are some of the challenges in keeping track of how the film was developing over such a long period? Were there a lot of things you didn’t expect and had to adjust along the way? WA: I initially thought I was going to write the script and record the actors and sort of design everything, but then hand it all over to a team of animators who were going to animate it for a year, and then they were going to send it back to me. I would see things along the way, but essentially, that wouldn’t be my job—they would be doing these little day-to-day movements, and I wasn’t going to sit there and watch that. That’s what I thought it was going to be like. And I thought maybe that I would be able to go direct another movie while we were shooting it. But in fact, as it began to unfold, I realized that this was not going to be the process at all, that it was going to be nothing like that. And for me to be really happy with the movie, I was going to have to do the same thing I do with every movie, and be involved with all the stuff, and kind of micro-manage every possible little thing I could get my hands on. The process with a live-action movie is, you do one shot after another sequentially in a race to the end of the day, when you lose the sun or you lose the man-hours, or whatever your deadline is. With a stop-motion movie, what ends up happening is, you have 30 different units going at once, and each one has its own animator or animators, and numerous directors of photography, a large art department of people making things, a department of people doing puppets, and so forth. So I had all these units going at once, and all these things being designed and built, and I had an editorial team next to me, and storyboard artists, and the process is instead a trillion things happening at once, very, very slowly. And so rather than following this sprint through the day, you instead do a little of this, and they say “We need you over here,” and you go over there. We designed this computer system where on my computer, I could go to each of the 30 cameras on the set, and I could bring up what the camera sees. I could see it live, or they could also send me a higher-quality image after four seconds or something, and I would talk to everybody on that unit on the phone and on e-mail, usually a combination of both at once, and I would also send them video images from my end. Sometimes I would act out something, or I’d have somebody else act something out to communicate things. So anyway, we were working in an old-fashioned animation style, but our communication system was very high-tech. WA: It was, except for that in this case, there were no actors on the stage. There were puppets being moved a tiny bit at a time, and the animators are like actors. AVC: Was this done wholly remotely, or were you coming in every once in a while? WA: Every once in a while—I would say three weeks out of a month—I was working at home or from someplace else away, and then I would go to England, because every now and then there are things… often when I was in England, I would sit in my office on the lot where we were working, or where I was staying in England, and I would do the same thing I would do if I was in France, for instance. I sit on my computer, because there are too many things for me to be able to leave the computer. But then there are also things that work better physically being there and just moving some puppets around and having a brainstorming session. Sometimes when we had a big problem, we needed to all get together and figure it out in a tactile way. But most of my work was done on my computer. AVC: Did the problems tend to be just technical in nature? When you’re directing a live-action movie, you can try multiple takes to make little adjustments in a scene. But with stop-motion, it’s like making a movie in very, very slow motion. WA: You prefer to do a scene only once. But you know, each shot—you’re working shot-by-shot—is all you’re thinking about at any moment. With my editor, I’m thinking about sequences and the whole length of the movie, but the day-to-day continual work that is endless over the course of production is “How are we going to do this shot? How are we going to do this next shot? What do we need to get right for this?” And for a shot, the dialogue is recorded, and I had a storyboard artist named Christian De Vita who was usually with me wherever I was, and my editor Andy Weisblum and I were working together to plan out the pace of the shot, and what happens in the shot, and to find a very detailed sketch of what it’s meant to be. Then our production designer, Nelson Lowry, he and I would discuss the sets, and how much set we need for the shot, and we’d figure out what kind of movement there is. Often we had budgetary constraints, and we’re trying to figure out a way to make this set work with some materials that we have and recombining things, and whatever that process is. Then there’s blocking the shot, and my director of animation, Mark Gustafson, and whatever animator is assigned to the shot, we work on that, and however many puppets are in there, and how that goes, and then usually there’s some version of Mark and I discussing a scene and acting it out. Maybe I send a little film that I do with a flip camera that’s my version of the things I can’t communicate in words—some bit of a gesture or look or something that I’m trying to get across that’s hard to describe. We have these series of conversations that everybody is a part of, and that sort of everybody weighs in on, and cc:ed through our whole group of collaborators, and then there’s this sheet that shows what happens on every single frame, right? And it says, “Frame 220. He begins to raise his arm, and he’s on the syllable D, duh, in the middle of a word,” and it’s that detailed. And even with all that discussion and all that planning, and this frame-by-frame detailed thing, no two animators would give you the same shot. Their personality takes over, and their taste, and their interests and skills, and so you’re always still surprised. And I get a bit more of the shot each day sent to me. I get dailies of each shot, and you watch the whole shot, but only at the end of it is the new part, so you’re watching it, and at the end you say “And here’s the new part, and what happened, good, good, that looks good,” or you say “We’re headed in a funny direction,” and you discuss it, or you say “This is amazing, I never expected this,” so that’s the process. Sounds crazy, I’m sure. AVC: And then you tried something unconventional by taking the cast members out to a farm, and having them perform there rather than isolating them in booths. How did that idea come about? WA: That one, I didn’t really even think about, because that’s so much the way I would generally want to do it. We wrote some of the script at Gipsy House. With something like Darjeeling Limited, we could have easily shot the film on a studio, but I preferred we go on a train in India, because it’s more exciting. AVC: Was it about having a more natural sound, or was it just about the ensemble coming together? WA: It’s about the whole thing of having a sort of documentary recording of us all in the real place. And having the actors really together so they’re experiencing something, having the fun of us all actually being there together and being a troupe together, and having the sound of the wind and the trees and the brook rushing, and all the qualities that brings to it. AVC: It must be a relief to just to have the scope of the thing come together there. You’re doing the micro-management of putting this little movie together, and here at least you get an idea of its pace and scope. WA: And there’s a freeness to having everybody all together, and you have the chance to say “In this part of the scene, maybe this needs to take a different turn. Let’s do a few rehearsals,” and they can talk at the same time, and they can argue, and the actors can bring in something new together. AVC: Where The Wild Things Are and this are both ostensibly family films, but they don’t fit into the boxes people expect. Was it hard for people within the studio—and maybe in the audience as well—to see your movie in a different light? WA: Yes—well, I wonder. I don’t know if I can answer for the audience, but I know that when I started the movie, I thought, “I’m making a children’s film.” It’s based on a book I read when I was a kid, it’s a children’s book, it’s animals talking to each other and being pursued by farmers that want to kill them, and it’s children’s material. But I barely ever thought about it again after that. Other than that being the point of departure, all I really did was, “I know we have to make it PG.” Writing it, Noah [Baumbach] and I always thought “What do we think is going to be funnier or more exciting or better?”, and that’s all. We rarely said “Will kids get this, or will some kids not get this?” And in the end, that’s why there’s a certain amount of Latin, for instance, in the movie. Latin is not usually at the top of a list of what a studio wants for a children’s film. [Laughs.] But I think if I was a kid, and I didn’t know about Latin, I would say “Tell me about Latin,” and I would probably get into it. So anyway, that was more or less our point of view. AVC: What about the studio? What did you hear back from them? WA: We kind of functioned on our own. I think it’s a kind of movie where the DNA is unusual in the first place, and because it doesn’t fit into any box anyway, people usually said, “Show us what you’re going to do.” If you fit more into a box in the first place, I think it’s easier for studio people to get involved and say “Well, here are the ways you’re getting outside of the box that we’re talking about, and here are some things that are not going to help us when it comes to selling the movie.” But if it’s such a weirdly shaped box in the first place, then there’s less inclination for somebody to try to tell you how to fix it, I guess. AVC: The end of the decade is approaching. As a moviegoer, what stands out for you as some of the most significant films or filmmakers of the ’00s? WA: Well, let’s see. I wish I had a list in front of me of all of them. I always think of the Coen brothers and Pedro Almodóvar and Paul Thomas Anderson, Noah Baumbach, Jacques Audiard. Who else… James Gray’s made wonderful films. I’m sure I’m leaving out many people who’ve meant a lot to me, but those are a few. But you know who I also often think about, lately anyway, is Peter Bogdanovich. I love his films, and I watched one that I’d never seen before, Nickelodeon. AVC: I’m surprised you hadn’t seen it. WA: I’d never seen it. There’s now a DVD now that’s in black and white. Originally it was color, but Peter wanted it in black and white. Anyway, I really enjoyed it, and he has a very special kind of style that’s not quite like anybody else. AVC: Seems like he’s due for a critical revival.